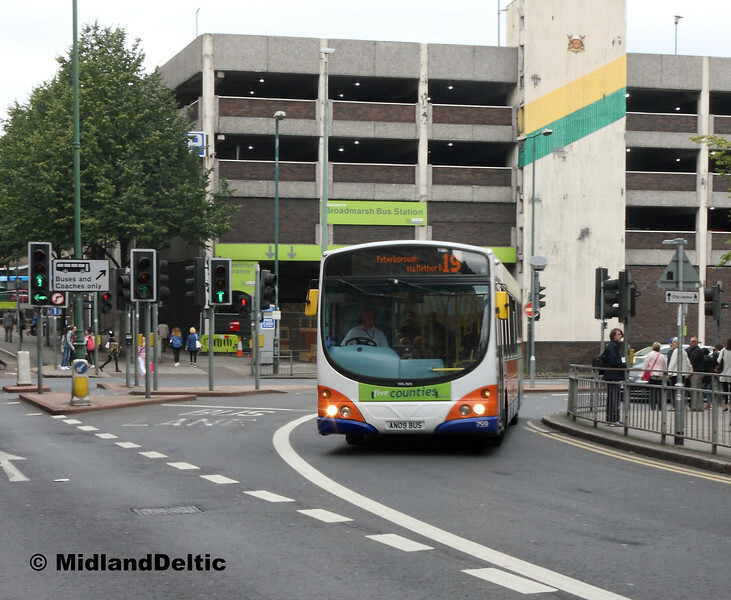 A visit to my home town, and a few shots of buses in the city centre and Beeston, with particular emphasis on the new bio-gas buses of NCT - together with a couple of more elderly vehicles! Not a good shot as the camera settings were wrong, but included as the vehicle type is unusual. Wright Pulsar bodied VDL SB200 659 swings on to Carrington St with the 19 service to Peterborough, branded as the Five Counties. It was new to Kimes. This long route has its' basis in Barton Transport route 2, which was gradually cut back over the years from Peterborough to Stamford, then Melton before Wellgalde dropped the route completely. In my survey days on that route, it was necessary to alight at Upper Broughton to get the return bus from Melton - not pleasant in the rain if the pub was shut! I doubt anyone would use this service end to end, especially given the much faster and more frequent rail option betweeen the two cities, but it does provide a large number of local links.